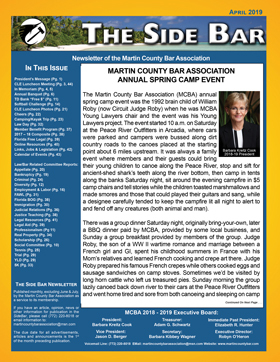 On behalf of the Martin County Bar Association (MCBA), I welcome you to our website and encourage you to take a few minutes to look at upcoming events, The SideBar monthly newsletter, and the list of committees to get a better idea of all that the MCBA has to offer. The MCBA is a voluntary bar association founded in 1955, serving not only Martin County’s legal community, but also the legal needs of Treasure Coast residents. Our membership includes more than 500 attorneys, judges, paralegals, and legal professionals residing in Martin, Indian River, Okeechobee, St. Lucie, and Palm Beach Counties. The many active members truly make this an excellent organization! 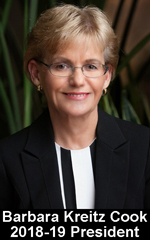 The scope of the mission of the Martin County Bar Association as a voluntary bar association is to serve Martin County's legal community and its needs, by providing high quality continuing legal education, information about our members to the general public, collegial social events and networking opportunities, and community pro bono outreach. To that end, MCBA hosts monthly luncheons which give members an opportunity to network, socialize, and obtain CLE credits, at no additional charge. At past luncheons attendees have had an opportunity to meet and talk with Florida Supreme Court Justice and former Chief Justice Jorge Lagarga, U.S. District Court Judge Robin Rosenberg, the first District Court Judge appointed to the Ft. Pierce courthouse, U.S. Magistrate Judge Shaniek Maynard, who replaced retired Fort Pierce U.S. Magistrate Judge Frank J. Lynch, Jr., University of Florida Law Professor Mary Adkins, Florida 19th Judicial Circuit Chief Judge Metzger, Martin County Clerk of Court Carolyn Timmann, who presented technology plans for court administration, Florida Bar President Michelle Suskauer, speaking on the state of The Florida Bar, many 19th Judicial Circuit county and circuit court judges and hearing magistrates, Florida Bar Presidents, and our own John Stewart, Florida Bar president-elect and former 19th Judicial Circuit representative to The Florida Bar Board of Governors, and who presented a technology CLE to attendees, and our own Greg Weiss, current 19th Judicial Circuit representative to The Florida Bar Board of Governors. We will continue to focus on providing technology CLE programs this year at our luncheon meetings. In addition to the monthly CLE luncheons, members may join one or more of our 30+ committees and attend committee luncheons without cost and where members have the opportunity to meet guest speakers in a more intimate setting and enjoy roundtable discussions. 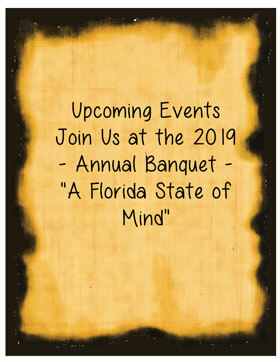 There are also many social opportunities throughout the year, such as our Fall Judicial Reception, Softball Tournament, Sebastian Inlet State Park Primitive Camp & Kayak Event, Happy Hour gatherings, 5K Race to the Courthouse, Tennis Tournament, and Annual Installation Banquet (which traditionally sells out very quickly). Please do not hesitate to reach out to me if you have any questions regarding these events or how you can get involved today. You will find a list of our committees, both substantive and social, on our website, as well as copies of our monthly Sidebar magazine, which provides valuable legal information and marketing opportunities. Please take a look at our website, as I am confident that you will quickly see many of the advantages of MCBA membership. I hope you will join me, and our more than 500 members, and enjoy all of the benefits the MCBA has to offer. You will be glad you did!